What Business Should I Start? guides you through a unique seven step process to identifying potential businesses you could start - making certain they meet your needs, suit your personality, fit your interests and goals - and that they have a realistic chance of success. The book then provides a framework for helping you choose among those potential businesses. • You have absolutely no idea which business to start; you don’t know which businesses would suit you - your needs, personality and interests, financial situation and goals. You probably do'nt need this book if you have already decided which business you want to start and are confident that it is the right one for you (in which case you may benefit from the companion to this book, Six-Week Start-Up, also by Rhonda Abrams). Millions of people dream about owning their own business; most never do. This book helps you become one of the fortunate ones who succeed! 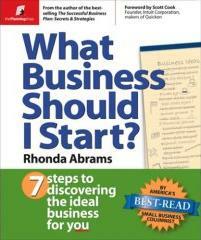 This book uses a seven step process to identify the type of business you should start. The first step is to learn your entrepreneurial personality and style. The author writes, "The fact that you may be shy or adverse to risks, or that you hate selling, doesn't mean you can't be a successful entrepreneur." To determine your entrepreneur type, the book provides a 54 question test. To tabulate your test results, the book provides a grid. The grid will indicate which type business is best for your personality (examples are; counselor, builder, caregiver, maintainer, trainer, entertainer, and so on. Following that in the book is a detailed description of each type and what businesses are best for each particular type. And this is just step one in the seven step process to identify the type of business you should start. I think this book is amazing. In fact, even if you don't want to start a business, this book will give you insight into what kind of job you should get. Reader Joshua Babbitt says, "This book is full of information that is helpful in learning about or selecting a business to start. It is broken into seven steps that help readers learn about themselves, their ideas, and a variety of small businesses that may fit with their aspirations. "I found the 'popular business categories' and 'popular individual businesses' sections to be full of interesting and useful information including details and statistics about the business, references to places to find more information and ideas to help you in starting that type of business. There is also a section on franchises that I found interesting. "I'd recommend this book to someone who is looking to start a business but needs help in sorting out their strengths and areas of interest, and to someone who is looking for a great resource of information on about different types of small businesses." Click here for more information."